Nuptiae albae Catholica Romana (Philippinae). Nuptiae civiles hominum eiusdem sexus (Civitates Foederatae). Nuptiae sunt caerimonia ubi bini homines matrimonio rite coniunguntur. Mores et traditiones nuptiales inter culturas, ethnos, religiones, civitates, classesque sociales magnopere variant. Plurimae caerimoniae nuptiales permutationem votorum nuptialium a maritis implicant, praestationem doni vel donorum (quae anuli, res symbolica, flores, pecunia sint), et apertam matrimonii proclamationem, a persona auctoritatis factam. Certae vestes nuptiales saepe geruntur, et hospitium nuptiale caerimoniam aliquando subsequitur. Musica, poesis, preces, vel lectiones ex textibus religiosis in caerimoniam saepe adiciuntur. Nuptiae Iaponienses in Fano Meidiensi. Multae culturae nuptias albas, morem traditionalem Occidentalem asciverunt, ubi nupta vestem nuptialem et flammeum gerit. Pictura ab Edmundo Leighton (1853–1922) picta. Nuptiae Hinduicae in India habita. Gourse, Leslie. 2005. Native American courtship and marriage. / Leslie Gourse. Summertown Tennesiae: Native Voices. ISBN 1570671702. Hirsch, Angelika-Benedicta. 2008. 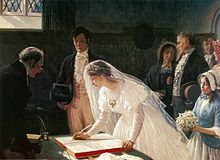 Warum die Frau den Hut aufhatte: Kleine Kulturgeschichte des Hochzeitsrituals. Gotingae: Vandenhoeck & Ruprecht. ISBN 9783525604373. Schott, Clausdieter. 1992. Trauung und Jawort: Von der Brautübergabe zur Ziviltrauung. Ed. 2a. Francofurti: Verlag für Standesamtswesen. Spangenberg, Lisl M. 2001. Timeless traditions: a couple's guide to wedding customs around the world. Praefatio Beverly Clark. Novi Eboraci: Universe Publishing. ISBN 0789305194. Tenzer, Eva. 2008. Ja! Alles übers Heiraten von Antrag bis Zuhören. Berolini: G. Kiepenheuer. ISBN 9783378010963. Vicimedia Communia plura habent quae ad nuptias spectant. Novissima mutatio die 4 Novembris 2018 hora 16:56 facta.